Have to admit that I don't understand this, the artist was born in 1403 and died when he was only 16 years old. And he started this painting four years before he was born? This is beautiful, although, I wonder if it is really as pink as it looks in this reproduction. Henry VIII inherited this from his grandmother Margaret, and I think it was made for her. I'm confused about what the dates refer to also. There is a lot on the internet about it. It happens quite often that I find the same image on different sites, and they look very different because the color differ a lot. So it's hard to know what the original painting look like. From what I can find out so far the 1403 to 1419 refers to when he was actively working in England. There seems to be a scholarly puzzle over his exact work and origins. His name is mentioned in various art histories and museum collections as either a German or Flemish master illuminator or minitarist. There are slides of his work in the Bodleian library in Oxford refered to as displaying "Continental influence on English illumination"
employment, 1401 – 3 , of one Herman of Cologne by Jean Malouel , court painter to Philip the Bold. 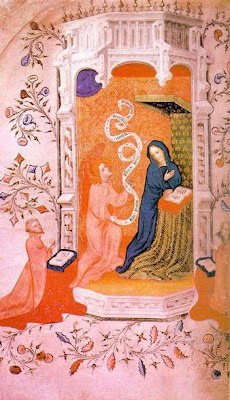 An artist with a truly international training, Herman Scheerre was one of the key figures responsible for the transformation of English illumination from about 1400 , and his workshop remained active for the first quarter of the century. Bibliography and More Information about Herman Scheerre from Rickert, M. , Painting in Britain: The Middle Ages (1965)." Thank you for your reserch! Much more interesting than washing up - I agree!